Finding a mechanic isn’t as stressful as going to the dentist, but for some people…it comes pretty close. They feel that they’re going to get scammed, so they are naturally nervous about the idea of taking their cars to a mechanic for the first time. It makes sense to approach this logically. Is it possible for every single mechanic to be a scammer? Not likely. The Department for Transport would get involved, the Ombudsman would get involved…there would be so many different agencies and authorities involved because it would literally be the scandal of the century. There are some tips to put into practice when hunting for a good garage. An independent shop still wants to earn your business, and they’ll try to gain your trust by participating in industry regulations, guidelines, and best practices. In this case, you want to look for garages that are associated with the Motor Industry Code of Practice. The Code of Practice insists that affiliated garages have clear pricing structures and give you clear billing each and every time. That sounds like the type of confidence you’re looking for, right? The worst thing you can do at the garage is just accept anything and everything. If you bring your car in, try to talk about what’s going on. How long have you had the problem? Do you smell smoke or any other odor while the problem is happening? When it comes to the cost side of things, you need to ask about a written estimate. Comparing prices is expected, and a mechanic team will want to walk you through what they need. 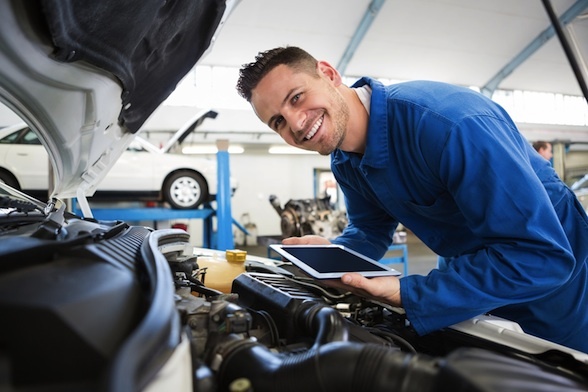 You may need to pay a diagnostic fee unless you plan to do the actual repairs at the shop. If they need to do additional repairs, tell them that they need to have them approved before they carry them out. Have them show you the new parts, and you do have the right to ask for your old items back. Real deal garages know that people are getting scammed left and right, so they’re going to go out of their way to make sure that they take care of you. If you’ve never taken your car to a garage, you probably have friends that have had to take this step. Make sure to ask them for who they take their vehicles to, because it’s likely they know someone really good. If you have a premium vehicle, be aware that you may be better off taking your car to the dealership. Good service is your right as a customer, and if you’re not getting what you need then you want to speak up about it. If the garage isn’t seeing things your way, you can always call the Office of Fair Trading, the same people behind the Motor Industry Code of Practice. There is even a freephone available where you can call and share your side of the story. If you walk into the garage with a working idea of what’s wrong and how to fix it, you look far better than the stereotypical “confused” person that has no earthly idea how their car works. If you need to take a class, there are some free ones available that can at least give you the basics on car repair. Even if you don’t want to repair your own vehicle, you should get the basics out of the way, at the very least. The right to repair is about being able to have control over who is handling your car, not just the right to DIY everything. Picking the best garage is a good idea that will save you a lot of money over time.